A mere two days ago I brought you a nice, healthy smoothie recipe, and today…it’s popcorn balls!!! 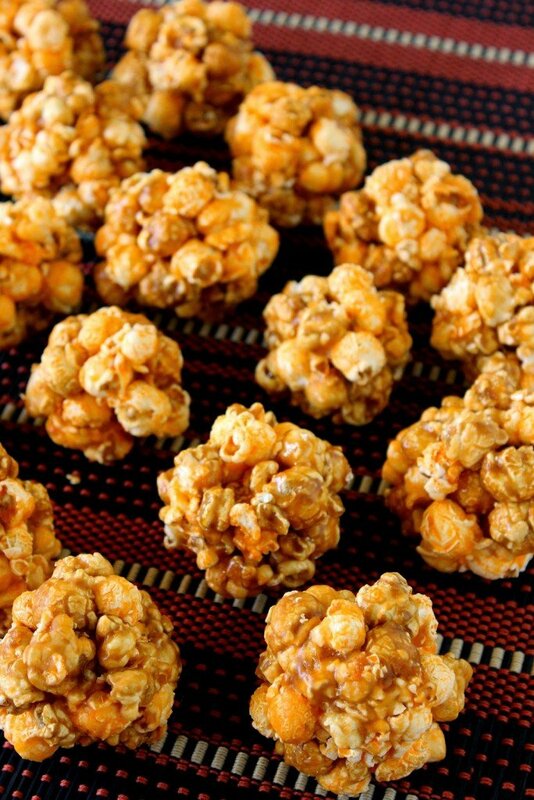 Not just any popcorn balls, mind you…CHICAGO MIX Popcorn Balls! You know the kind. 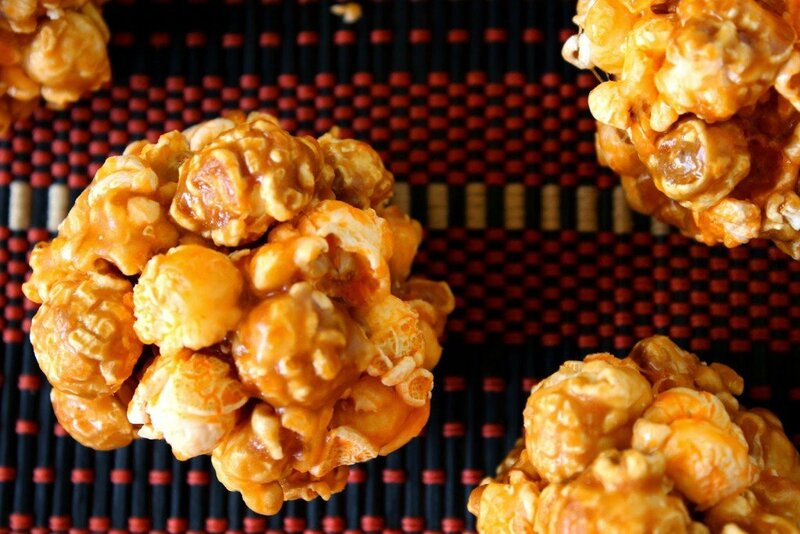 Sweet, buttery caramel corn that’s mixed with salty, cheesy cheddar popcorn. It’s that salty sweet thing that keeps your hand going from the bowl to your mouth like it’s on auto-pilot! Now, you’d think with me living fairly close to the city of Chicago that I would have purchased my Chicago Mix popcorn from Garrett’s Popcorn Shops, (the originator and manufacturer of THE best Chicago Mix popcorn in all the world). But, sadly I didn’t. I purchased my knock-off Chicago Mix at Costco while I was there shopping there for something else entirely. Go figure. It was only on my way to the register (to pay my always mega bill) that I spotted the giant bag of Costco’s Chicago Mix popcorn (manufactured by G.H. Cretors). -Place the popcorn in a large oven safe container and place in the preheated oven while you prepare the syrup. 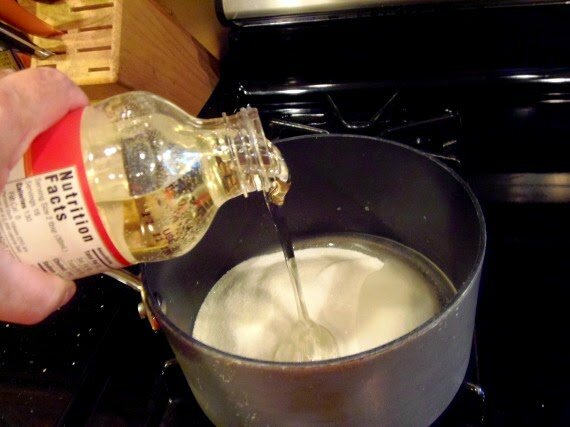 -In a large saucepan, combine the sugar, corn syrup, water and salt. Cook over medium heat until a candy thermometer reaches 235 degrees (soft-ball stage). -Place some ice cubes in a large bowl and fill with water. Set aside. 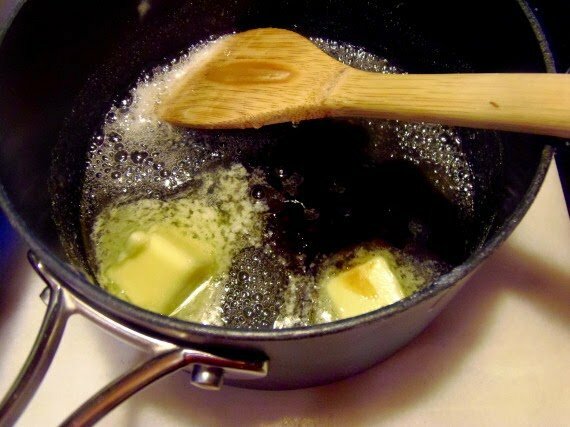 -Remove the syrup from the heat and stir in the butter and vanilla extract. 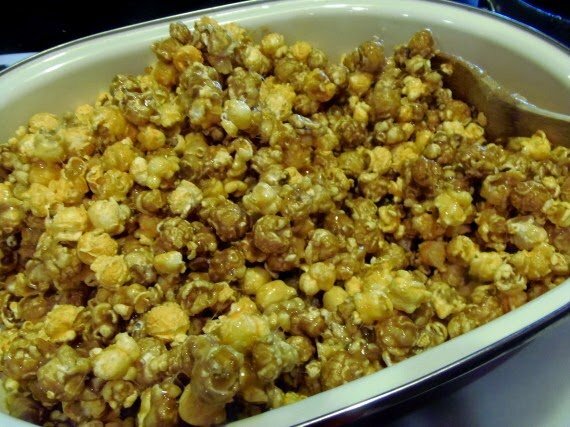 -Remove the popcorn from the oven and pour the hot syrup over the popcorn. -Using a wooden spoon, quickly stir the popcorn and syrup together. 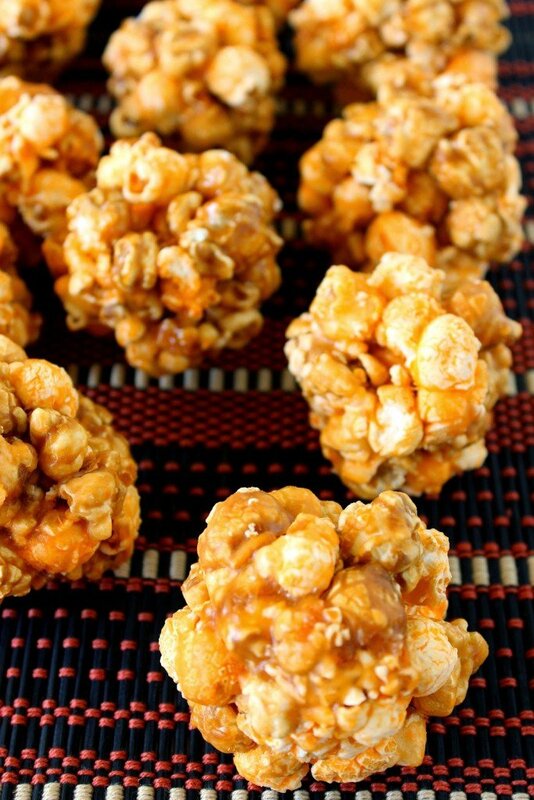 -Dip your hands in the ice water and quickly shape the popcorn into 3″ balls. *Note – this is not something for kids to do as the mixture is extremely hot and sticky. The ice water will help cool your hands and also prevent sticking. -Once cooled, they can be wrapped for individual gift giving or set out in a bowl. 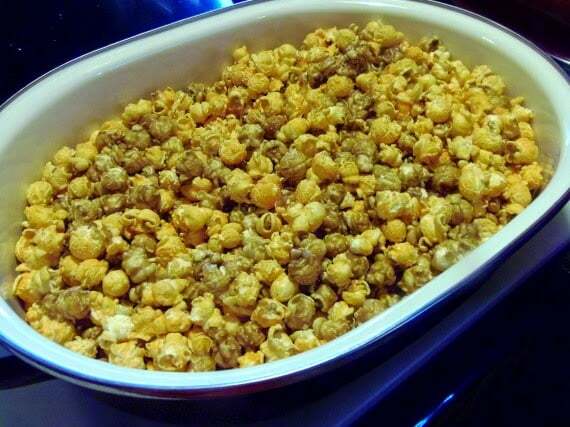 Place the Chicago Mix popcorn into a large oven proof pan. Place it in a preheated oven while making the syrup. Heat the sugar, corn syrup, water and salt to 235 degrees on a candy thermometer (stirring occasionally). Once the syrup reaches soft ball stage (235) remove it from the heat and stir in the butter and vanilla. 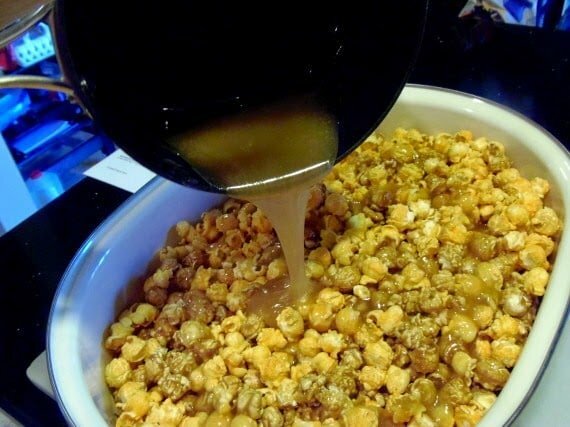 Carefully pour the hot syrup over the warm popcorn and quickly stir it so all the popcorn is coated in the syrup. Have a large bowl of ice water near by to use on your hands to prevent burning and sticking and quickly roll the popcorn into 3″ balls. There you have it. That was easy, don’t you think? These will make terrific treats for your little ones at Halloween and as a fun lunchbox snack beyond that. Wrap these balls tightly in some cellophane bags or plastic wrap and they should keep fresh for 7-10 days. If there is ever anything I can paint for you, please don’t hesitate to contact me or visit my shop. Custom orders are always welcome, and I can work from any photo or design idea you may have. Kudos Kitchen by Renée ~ Where food, art and fun collide on a regular basis. Thanks for visiting me in my Kudos Kitchen. I sincerely hope you’ve enjoyed your stay. I love G.H. Cretors' Chicago Mix! In fact, I reviewed it last year before Halloween and I've been an addict ever since. Portion control, eh? Yeah, that might work. LOL! Maybe. Popcorn is my absolute favorite snack. I make it every day. Would eat every one of those balls with reckless abandon! I've never heard of Chicago pop corn, but these little balls are so cute! Popcorn balls are so much fun! 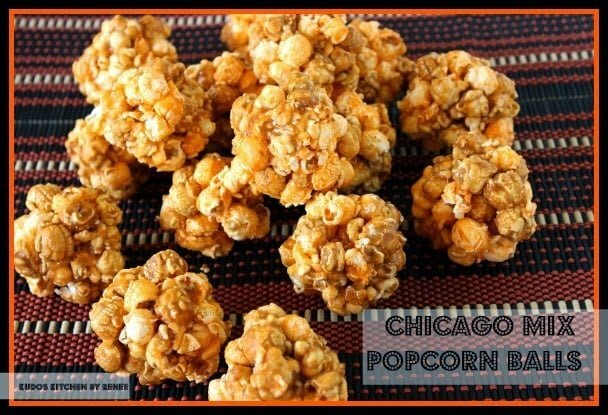 I've never heard of this Chicago pop corn – need to try!!! These popcorn balls look great. I love sweet and salty together and they do sound easy enough. BTW, I love that painted bowl! My kids would love these!! I need to try Chicago popcorn, I've never head it! I've never heard of Chicago popcorn either – another reason for me to make a visit in the future! Your recipe looks great – it makes me want some now! Oh. Em. Gee!! Garrett's Chicago Mix Popcorn is by far the best popcorn on the planet. I scoffed the first time someone tried to get me to eat cheese corn + caramel corn…but only for a minute. I'm a total convert! 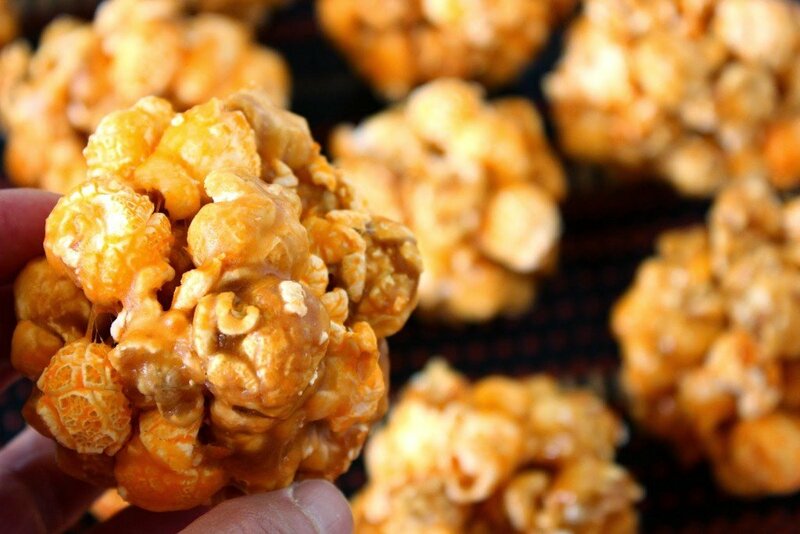 Your popcorn balls must be deadly addictive! Portion Control, hehe. Caramel corn is my weakness. I hope someone buys me one of those popcorn tins again this year. I cannot stop myself around caramel corn. These little treats look amazing. Oh my heavens – you had me at the first glance at these sweetly salty lovelies. I've never seen popcorn balls but I now think they are the bomb! 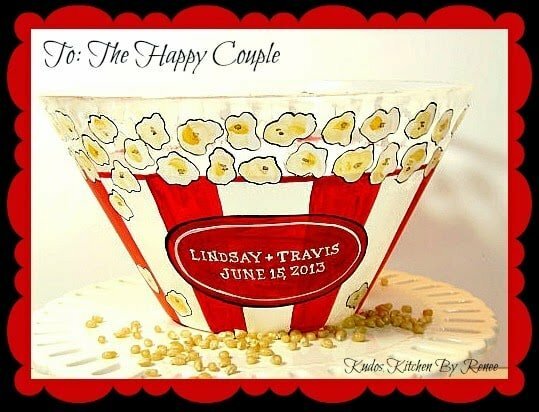 Love the Popcorn painting. How much does it cost. I would like one for my daughter and new hubby. Wedding gift.